The Rev Kate Bottley finds out how St John Ambulance began as an ancient Christian order in Jerusalem back in the 11th century. Browse content similar to Today's Good Samaritans. Check below for episodes and series from the same categories and more! who've been treating sick and injured people for over 140 years. had to put his life in the hands of his students. I found myself going, "Come on, Jesus. "One, Jesus, two, Jesus, three, Jesus..."
Order of St John, and the monks who founded it. the first person in Britain to donate a kidney to a complete stranger. and that many things that we can do, we should do. here at the headquarters of St John Ambulance in Clerkenwell, London. 400,000 people a year learn how to save lives. because you never know when you're going to need them. and our music today comes from across the UK. St John Ambulance have been helping others for decades. like our group here today in London. Each of us learning first aid has our own reasons for being here. when a situation is going to come up where we might need to step in. Our ages range in our family from 60 down to 6 weeks. So any kind of situation could come up. health problems, and I'm quite mindful of that. back, so I thought this was a good opportunity to do that. Shall we say Chloe's left forearm might be fractured? like so, and there we are. Encourage her to support it. Running our session is David Knowles from Exeter. He's been a St John Ambulance trainer for 17 years. and whatever their age might be. of you, something that can easily be covered in this modern age. David feels that helping people in need is part of his Christian faith. to use today's terms, whilst everyone else was passing him by. I think you will find that Jesus never passed somebody by who asked them for help. Do you think Jesus would be trained in first aid? -I think he's the instigator of it. when he had to rely on one of his students to save his life. Thank goodness he's such a great trainer. Our next hymn is a joyful celebration of the ultimate saviour. to the ancient religious Order of St John. and its surprising link to Jerusalem. Tom Foakes is the director. Now, Tom, I recognise this church. -where Jesus is supposed to have been buried. they were often in quite a poor state of health. and provide them with first aid care. the man who we can thank for all of this. and began that exemplary healthcare. Gerard is also responsible for the insignia of St John. The famous eight-pointed cross was worn on the monks' robes. as a symbol of first aid and humanitarian care. building hospitals and churches wherever they went. St John's Gate here in Clerkenwell in London became its English base. -Tom, this place is amazing. so this was the real focus of that religious devotion. So what happened to the Order? Well, in 1540, if you know your history, Henry VIII on the throne. the Order of St John was the last Catholic order in England to be dissolved. died of a broken heart on the day that the Order was dissolved. Because he had lost his order to the dissolution of the monasteries? Absolutely, yes. And we have his effigy, from his tomb. But it didn't stay lost for long, did it, the order of St John? Well, in the 19th century, Britain was transformed. and all those St John Ambulance volunteers who provide first aid to the public. Amazing to think that it all started because of the need to care for sick travellers. when they made their journey to Jerusalem all those centuries ago. Billy Graham died, aged 99.
one of their kidneys to a complete stranger. and began a whole new movement of good Samaritans. never met is still a relatively unusual thing to do. to donate to someone she didn't know. I was in a good position to do it. And what was your motivation? then why not give it to somebody you don't know at all? But Kay discovered doctors wouldn't allow her to donate. So she wrote to the Department of Health to ask why. as I felt I was able to without being classified as a nutcase! to somebody you don't know, there's no chance of money changing hands. I could, so I wrote a letter and, in due course, the law was changed. and regularly gives talks about her successful operation. I'd be really terrified, even if I wanted to do it. There aren't too many risks associated with it. There's always a risk with any surgery, which one has to accept. looked-after and likely to stay healthier than if I hadn't done it. -Did you ever meet the person you donated your kidney to? particularly the recipient, that can happen. But it isn't so in my case and that's... I'm fine with that. Also here today is Lisa Burnapp from NHS Blood and Transplants. -Is there an age limit? and the oldest was 85, so you can see the sort of range. One of Kay's favourite hymns sums up the sense of calling she felt. that's quite motivational when you sing that bit, "Is it I?" what you can be doing that you haven't done or might be able to do. we're marking the 140 years of St John Ambulance first aid training. This is cardiopulmonary resuscitation - CPR. Here we go. Keep contact, yes. Keep contact. David knows only too well how important it is to teach first aid. when his life was at risk, as his friend Karol explains. and each year, David is asked if he will do some first aid training. I began to feel rather unwell. "I know what this is about,"
"he's going to start off by some scenario,"
exactly what he often does. that I was having a heart attack. Karol, what was going through your mind? If I'm honest, it was absolutely terrifying. so it's a very strange feeling. to walk through the door at that precise moment. part about the expert didn't, so it really was down to us to cope. remember saying, "This would be hard to do in a real-life situation." "Come on, Jesus - one Jesus, two Jesus, three Jesus..."
I remember getting to 40 and saying, "Come on, Jesus!" because I'm sure we didn't do things in a textbook way. at a time when we really, really needed it. -David, you must be very proud of your pupils. but she bought me the time that enabled the experts to get to us. David spent almost a month in hospital, but made a full recovery. in front of us, may we still be singing by the end of the day. God had been with us at a time of very great need. Well, that's almost it for today. and Claire McCollum are in the UK's smallest city. but also has links to Saint Patrick. And we've a special performance from Katherine Jenkins. We end today with a hymn that aims to bring everyone together. 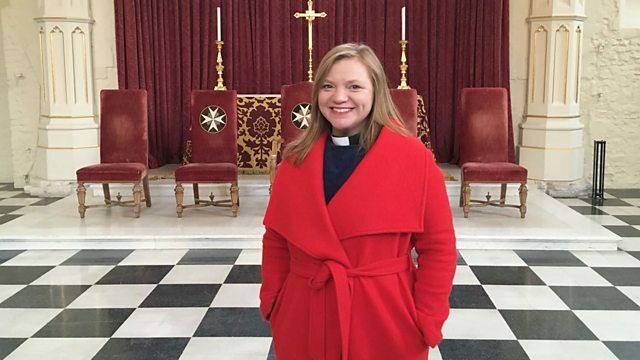 The Rev Kate Bottley finds out how St John Ambulance began as an ancient Christian order in Jerusalem back in the 11th century and brushes up her first-aid skills. JB Gill meets the first person in the UK to donate an organ to a complete stranger. And in memory of Billy Graham, Just As I Am from Hereford Cathedral.